There's something you need to know about my husband. As much as he loves soup (passionately), equate that level to the hatred he has for mayonnaise. 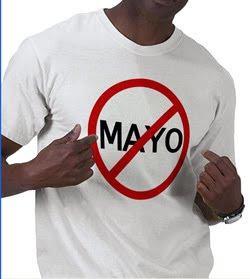 Much to his mayo-loving wife's dismay...I love potato salad so much it's really a little sad. Not quite as much as he loves soup, but it's a solid and long-lasting relationship. Thus began my quest to find a potato salad we both like. I knew it couldn't have mayo or mustard in it (another one of his condiment hatreds) and I'm not real keen on a super-strong vinegar taste. Then I came upon this recipe...Sunny Anderson's "Tangy Tater Salad". Jackpot! As I skimmed over the ingredients, little checkmarks appeared in my brain. You get the idea...and best of all - no mayo or mustard! This potato salad smells absolutely fantastic. I made it tonight for our dinner tomorrow night, so it'll chill overnight in the fridge, allowing those flavors to completely be soaked up by the potatoes. I can't wait to dig into an entire serving tomorrow, satisfying myself with a small forkful to fulfill my quality control duty tonight! 1. Put the potatoes in a large pot and cover with water by 2 inches. Salt the water extremely well and bring it to a boil. Once the potatoes come to a boil, reduce the heat to a simmer and cook until soft (10-15 minutes). While the potatoes are cooking, fry the bacon until crisp, then remove it and pat it dry with paper towels - set it aside. 2. Carefully drain all but 3 tbsp. of the bacon drippings from the pan and return it to medium heat. Add the garlic, jalapenos, scallions, paprika, salt and pepper. Cook over medium heat until the scallions and jalapenos are tender (3 minutes), then add in the flour, stirring until the veggies are evenly coated (2 minutes). Stir in the sugar, vinegar and dip 1 cup of water from the cooking potatoes to add. 3. Bring the sauce to a boil, then lower the heat and simmer until thickened and slightly reduced (about 5 minutes). Drain the potatoes and transfer to a large bowl. Add the bacon and pour the sauce over the potato mixture. Toss well to coat. Refrigerate until ready to serve!